P Farrelly & Sons Funeral Directors is a family run business, since 1994. We offer a confidential comprehensive and a dignified service with the highest standards at all times to those who have suffered bereavement… Peadar or Bobby can be contacted 24 hours a day, from this one call we will look after all aspects of the funeral arrangements in the deceased family residence, hospital or at Dunderk Slane or Johnstown Navan. With our personal professional approach we will do our best to lighten your burden in every possible way we can. We provide all Funeral Services in Ireland, based in Dunderk Slane and Johnstown Navan County Meath , However we also provide services across Ireland and internationally. Saint Joseph’s Chapel of Rest contains a reception area, reposing room a family room, and use of our kitchen facilities and refreshments. 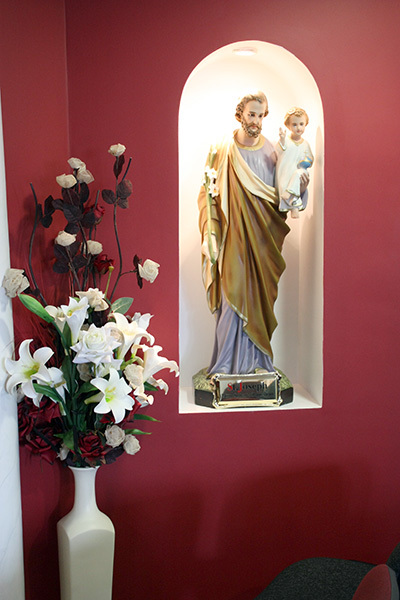 St Joseph’s Chapel of Rest is available at all times to all denominations and families, we provide family use of St Josephs Chapel of Rest and host a reception and prayer service for friends and relatives of the deceased. Please advise us of your needs when speaking with our Funeral Directors Peadar or Bobby at the time and we will arrange any special requirements. Everyone is unique, and their choice in ceremony may differ depending on religious, cultural and personal preferences so we are here at all times to advise and help to organise the type of ceremony that reflects your wishes. We will provide you with an aftercare service including assistance with memorial monuments and cards, you will also be provided with all the information and forms that you will require to enable you to claim your bereavement grant and pension entitlements. P .Farrelly & Sons © 2013. All Rights Reserved.